The scene was set for a special night at Gorton Monastery for the 2015 MPA Inspiration Awards. The first award of the night came along shortly after the main course and before we knew it, our MD, Daniel Nolan had the Best Digital Agency Campaign award in hand in recognition of our work on the #Blackpoolsback campaign for Merlin Entertainments. Absolutely delighted with this win, we anxiously awaited our second and final category shortlist for Digital Agency of the Year. Aware we'd had a strong year, growing our turnover by 37 per cent, doubling profits and approaching 50 members of staff, we still faced some stiff competition. Being crowned Digital Agency of the Year really was the icing on our cake following a great month for the business. 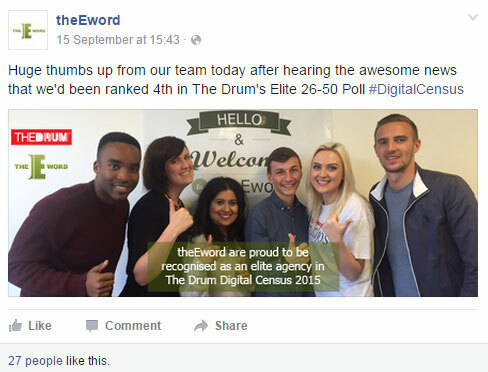 For the first time in theEword's history, we achieved Elite Agency status, securing 4th place in The Drum’s Digital Census 2015. We also placed 23rd in the Financial category for agencies with 26 - 50 staff. The Drum's Digital Census identifies the UK’s top-performing search marketing agencies so we were delighted to be recognised. With more award nominations for our client work to be announced later in the year, theEword team is excited to continue driving more traffic and delivering more conversions for our clients thanks to our content-driven, fully integrated digital marketing campaigns. If you want more success online, get in touch with our award-winning team today. We'd love to hear from you.